We have 4 pairs of tickets to give away for Snow Patrol’s very special show in Ward Park, Bangor, Northern Ireland on May 25th! 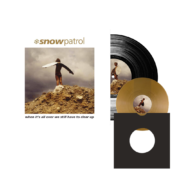 To be in with a chance of winning two tickets simply pre-order the Limited Edition LP release of ‘When It’s All Over We Still Have To Clear Up’ – the one with the bonus gold vinyl 7” – from our store and your name will automatically be entered into the competition. We’ll pick the winners on March 1st when the LP is released! If you’ve already pre-ordered the record don’t worry, you’re in the draw.